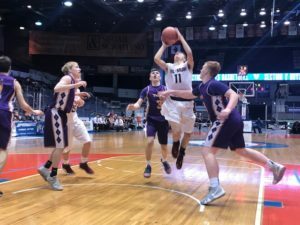 ROCHESTER, N.Y. – Caledonia-Mumford surged to a double-digit second quarter lead and never let the game get close en route to a 57-46 win over York in the Section V class C3 final. “To see us now, the celebration here, I think those guys are going to look back at this and realize the coaches pushed them for a reason,” Caledonia-Mumford head coach Dan Dickens said. Leading 15-10 going into the second quarter, the Caledonia-Mumford Raiders started the period on a 9-2 run for a 24-12 edge. Junior guard Vin Molisani sparked the charge with a three-point play. Freshman Kyle Wade made a pair of layups on back-to-back possessions. Junior forward Joe Laursen knocked down a mid-range jumpshot from the right wing. During the run, the Raiders held the York Knights to four missed field goals and two turnovers in seven possessions. Molisani poured 18 of his game-high 20 points in the first half as the Raiders had a 36-24 lead going into the locker room. The junior guard grabbed seven rebounds and handed out three assists. Wade scored eight of his 12 points through the first 16 minutes of game play. The freshman forward collected five rebounds, dished out three assists and swiped a steal. Laursen had all 12 of his points by the end of the third quarter as the Raiders extended their lead to 52-34. The junior forward pulled down seven rebounds and had an assist. Senior guard Eric Wilson chipped in nine points, hauled in nine rebounds and collected an assist. For York, Matthew McFarland netted 11 of his team-high 18 points in the first half. The senior guard pulled down 11 rebounds, swiped four steals and handed out a pair of assists. Caledonia-Mumford wins its first sectional title since 2015. The Raiders, who were also the top seed, defeated No. 6 Geneseo to claim the Section V class C2 title. 0; Jack Geary 0-0 0-0 0; Connor Reilly 0-1 0-0 0; Lucas Garza 0-0 0-0 0.